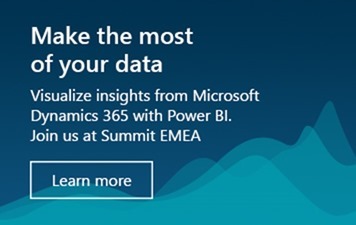 I invite you to join me at Summit EMEA and learn about how you can maximize the value in your data by using the amazing capabilities in Power BI. At the event, you’ll hear what’s new with Power BI, discover new ways to deliver insights for your business, hear from power users and experts, and learn how your peers are using their data. Data is at the heart of all business and Summit EMEA is a great opportunity to stay informed about the latest data innovations. Power BI is gathering significant momentum in the market, with recognition both from analysts as well as a rapidly growing community of users. One of the reasons for Power BI’s success is that we in the product engineering team, are continuously updating the product based on user feedback. Summit EMEA is a great opportunity to hear about the latest Power BI updates and what’s driving our user-led innovation. Power BI is part of the overall Microsoft Business Aplication Platform and works closely with other products such as PowerApps and Flow. These related products will also be covered at Summit EMEA. We will have a dedicated track and sessions for Power BI, I will kick off this track with an overview of how Power BI helps Dynamics 365 users make sense of their data. We’ll explore live and actionable visualizations that help you make prompt, impactful decisions. All this with some really cool demos! Mobile insights with Power BI on the go. Using R with Power BI. Data modeling using Power BI desktop. Developing your first Power BI report. Using solution templates to deliver turnkey solutions. View the full schedule of Power BI content. Mike Ehrenberg, CTO for Microsoft Business Solutions, will deliver the keynote for Summit EMEA and discuss Microsoft’s strategy for intelligent business applications. You’ll get an inside view on Dynamics 365 and how it unifies CRM and ERP capabilities into purpose-built applications to help you meet the changing needs of today. I hope to see you at Summit EMEA.